Yuri anime isn’t a genre I’ve spent a significant amount of time watching, though I have seen a decent number of series that used yuri implications for comedy (YuruYuri, Yuyushiki). It’s seemed like recently more anime adaptations of yuri themed manga have been greenlit, including Sakura Trick which I saw quite a bit of buzz about across the Internet as it aired between January and March. There’s a specific section of the anime fan base that likely watched this show solely because it has girls kissing each other, but I’m not part of that particular crowd. Instead, I like series that have likeable characters and moments that make me smile, and set to find out if Sakura Trick could do just that. As you might’ve guessed, if you’re not particularly interested in seeing anime girls kiss this probably isn’t a series that is going to be very appealing. Sakura Trick revolves around Haruka and Yuu, two girls who were inseparable best friends in middle school and have just started high school. One thing leads to another, and early on in the first episode they decide to do something that will create a special bond between the two of them, which is to kiss. 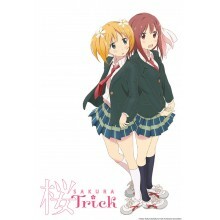 Whereas most anime that has any kind of romance focus has two characters that like each other but are unwilling to admit it and have physical interaction, Sakura Trick starts off with the physical attraction and Haruka and Yuu struggle to figure out exactly to define their relationship. It’s a definite change of pace from what I’m used to, and was one of the reasons that I was drawn into the series early on. Shortly after the initial relationship between Haruka and Yuu is established, the remaining main characters are introduced. Shizuka and Kotone are the other two girls in the series that continue the yuri trend as they’re shown kissing early on as well and seem to harbor feelings for each other, which becomes a bit stranger once you find out that they’re cousins. Kaede and Yuzu are two additional classmates that are often used to up the comedy of the series, as Kaede likes to prank the others and Yuzu is the straight man that is oblivious to all of the things happening around her. The final addition to the cast is Yuu’s older sister Mitsuki who starts off very suspicious of the relationship between the two but as the episodes progress it seems like she might be falling in love with Haruka. I like the fact that the cast is fairly small, as it gives each one the chance to gain a bit more depth and have a few standout moments. After Haruka and Yuu start kissing and unofficially begin a relationship, the series falls into a familiar romantic comedy/slice of life format. There isn’t any major plotline aside from the girls going through their first year of high school together, and this leaves room for some comedic moments and plenty of kissing in different locations. Sakura Trick relies on a lot of familiar scenarios that anime fans have seen time and time again (such as the test of courage, preparing for the school culture festival etc. ), but the characters are endearing and quirky enough to ensure that this didn’t really bother me and I enjoyed what each episode had to offer. If you’re looking for any kind of major development in the relationship between Haruka and Yuu I think you may come away a bit disappointed, as after the first episode or two it stays at around the same point until close to the end of the show. There’s definitely more progress than most high school romance anime though, where the two that are “in love” don’t fully admit it until the very last scene. Quite a few of the situations may have felt a bit familiar, but the character personalities definitely managed to win me over and the humorous elements definitely had me smiling and laughing as I was watching. Haruka and Yuu fit well together, and their attempts to kiss each other in secret almost get them into trouble on a regular basis. Neither of them really fits into the role of the mature one in the relationship, as there are moments throughout the series where both act childish and even get jealous over one another at relatively small things. Each character has their own quirks, and I thought that both Haruka and Yuu were developed equally and liked how elements of their attraction to each other had a slight bit of realism mixed in with the comedy. The other members of the cast also has their moments, as Mitsuki ends up taking a larger role than I had been anticipating and as I mentioned earlier Kaede and Yuzu both have some great moments throughout. The only two I wasn’t fully sold on were Kotone and Shizuka, as even when they got close to half an episode’s worth of focus I still don’t feel like it developed their personalities that much. Studio Deen produced Sakura Trick, and out of the recent series I have seen from the studio I have felt they have been fairly hit or miss. This is one of the hits in my opinion, as not only does it seem like they were able to perfectly capture the feel of the original manga but gave everything a very bright and colorful look that is sure to draw in the slice of life crowd. Since this is a yuri show there’s a considerable amount of fan service, and this is evident right from the opening sequence as it is not only bursting with color but has dancing, kissing, and other fan service shots crammed into a minute and a half. Aside from that, the overall look and feel reminds me quite a bit of your standard slice of life series that is set in a high school, as there is the familiar mix of normal characters with exaggerated chibi expressions to liven things up. It’s sickly sweet at times but that’s something that I like in my anime, so I suspect if you feel the same way you’ll find the animation to be quite appealing. Both the opening and ending themes are your standard J-pop fare, and while they aren’t tunes that got stuck in my head for days on end they were likeable enough to convince me to watch both the opening and ending sequences a few times rather than skip right over them. The voice actresses for Haruka and Yuu are both fairly recognizable, though I’m not sure if either one has done a major role in a yuri anime before Sakura Trick (I recognized their voices from series like Haganai, Hanasaku Iroha, and Binbougami-Ga!). You wouldn’t necessarily know that though, as the duo has good chemistry and helped to add distinctive personalities that allowed the series to stand out more compared to some of the others out there. The rest of the cast fit their roles but didn’t necessarily deliver a performance that I’ll remember months from now, though I do want to give a shout out to Saki Fujita who continues to do the tsundere style role quite well (she’s previously done Mahiru from Wagnaria!! and Ayano from YuruYuri). Overall, the cast is definitely likeable enough and that works in the show’s favor. If you’re a fan of yuri anime/manga, Sakura Trick should definitely be on your radar. But even if you’re not watching just for the yuri element and enjoy a slice of life/comedy with some likeable character, this series still has plenty of elements that will make you smile and laugh throughout its 12 episodes. Don’t look for the greatest amount of substance, but taken as a sugary sweet, fan service heavy viewing Sakura Trick’s sure to be a guilty pleasure for quite a few anime fans. YURUYURI Season 2 Premium Edition out now!